Have you ever been hugged by an elephant? or how about being splashed by giant tigers as I sat on the edge of their pool as they scampered in a sort of water tag with each other. O Lord, How can I count thy blessings? What a day You offered me. I spent the morning surrounded by Indian elephants and the afternoon Bengal Tigers from Northern Thailand’s jungles. It was another example of being in a kind of Eden of acacias, palm trees, ferns, frangipanni, strelitzia, water lilies and lotus. 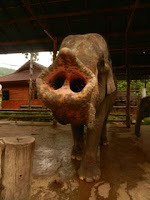 When we arrived at Maepan Elephant Park mid-morning, it looked like a tourist trap. Tons of vans and mini-buses spit out people, many Muslim women, many Asians, and they were herded to the elephant show. 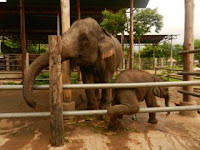 In a open-aired barn, big mama elephants were chained at the foot, as usual, throwing around corn stalks while their babies played freely. 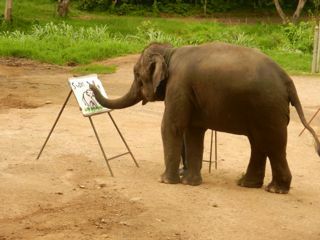 We were blessed at once to be able to sign up for the mahoot training experience to learn how to communicate with, ride and play with elephants one on one. 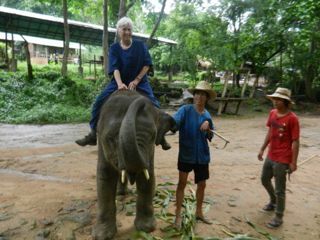 The reason crowds come here is to ride elephants - in a metal seat strapped to the poor elephants stomach. After a short turn, then they change to a ride in a cart drawn by water buffalo or take a bamboo raft down a raging river. The water buffalo were really white humped Brahma bulls. But our focus was on elephants. I wanted to ride mahoot style as I had done in Chitwan in Nepal, not in a metal seat. 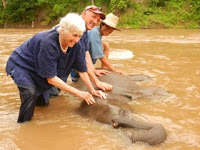 We were told we had to put on mahoot kind of uniform - dark blue with Chinese monkey knots for closure - because we would end the course in the river bathing our elephants. Ok. I was game. It turned out I was sopping wet most of the day because there was constant rain as well and I gave up on umbrellas and plastic rain ponchos. 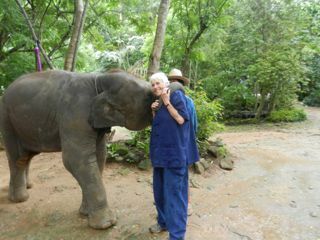 Then we met our elephants - one a baby of five and the other a female 40 years old, with their real mahoots from the Keran tribe. And took a walk up to an area where the elephants and mahoot live. It was pouring rain, hot as the tropics are, and mud pie in the roads and pathways. But hey, I’m with elephants, who cares. First I was told I’d ride the younger elephant named Maetang who kept poking his trunk at me and I think that was a way of making friends. He had tiny tusks growing. As usual, I was sloppy getting my leg over his neck, as he bowed down low. I had to push back to sit on his bony back because of his age. But I had something to hold on to, a rope, and felt comfortable with his playfulness We walked around a bit. And I learned to say “Bai” for go, “Hoa” for stop and “ma-long” for get down on knees. Then I was to ride the big female. This had a different mounting. She too got low to the ground and offered me her bent leg to step up on but she had an even more enormous neck. The teacher had already gotten on her nervous that I would fall, when I knew I wouldn’t. This was more my liking because I was on the neck and my legs behind her ears. I had nothing to hold on to, however, and was told to just press my hands on her head. The chief mahoot was behind me holding my waist for whatever fears he had. Ok. Did that. I felt in heaven as she took her large swaying steps slowly so I could move with her. I asked if they did this every day and the mahoot said yes these two elephants were the mahoot training class victims. Meanwhile, the rains poured. I gave up on the Vietnamese-like hat. What’s wrong with a wet me? We were invited to lunch at a bench overlooking the river in front of one of the mahoots’ houses. Then it was time to get back to work. But first a couple of tricks: The baby gave me a hug with his trunk - (trunk around my neck, pearls and all), he gave me a trunk kiss, and he also picked up a hat and put it on my head. I walked with the baby elephant back to the camp passing the giant elephants carrying the latest lot of tourists while Jim rode the big female on a longer route to see what it was like. He reported, very rough riding. Then it was time for the river. I changed into my sandals and survived the steep incline into the rather brown raging river. 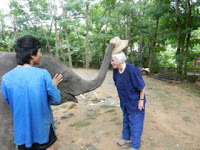 This is the favorite activity of all elephants and they lay down and roll over and enjoy the attention as we scrubbed them. The baby’s eyes looked at me and she continued to play with me with her trunk, loving the cool water. Then when it was time to finish, she showered us with sprays of water from her trunk. I think I had grown attached to this little one. I wonder if elephants never forget.